How was everyone's weekend? Hopefully great? My Friday night started out with Friday Night Supper Club - if you don't remember this is a group of girls I get together with a few times a year. We all used to work at the same company, and now this gives us a chance to catch up, since we all seem to be producing babies and our lives have gotten busy! We met at Pam's house and it was grill out time! 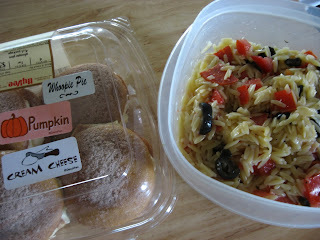 Store bought (but deliciously good) Pumpkin Cream Cheese Whoopie Pies and an orzo pasta salad. I wasn't feeling the pasta salad once I arrived, but of course was feeling the whoopie pies. 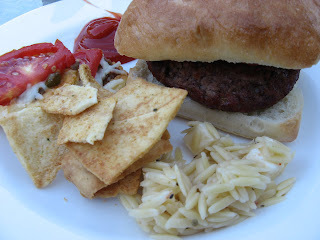 Pam made delicious burgers on the grill with her homemade chipotle sauce. To-die-for! She said it was a combo of mayo, lemon juice, chipotle peppers in adobo sauce, salt and pepper. Puree it all up and there you have it! I need to re-create this at home. 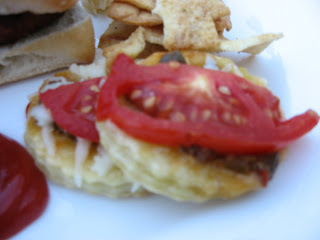 Erica brought these insanely good appetizers, and with her permission I'll be chatting about them in a few days. They deserve their own post! Great friends, beautiful weather, good food, can't beat it. Just wish I could see these girls everyday! Tune in tomorrow for my Apple Bar recipe and the story behind them - there was DRAMA. Lets just say it involved one of our dogs, who spent the rest of the day in the laundry room. Oh no is it Lexie the 2nd??? was'nt that your dogs name? i just made some homemade pumpkin whoopie pies with cream cheese frosting last week! YUm! I have never had a whoopie pie before!